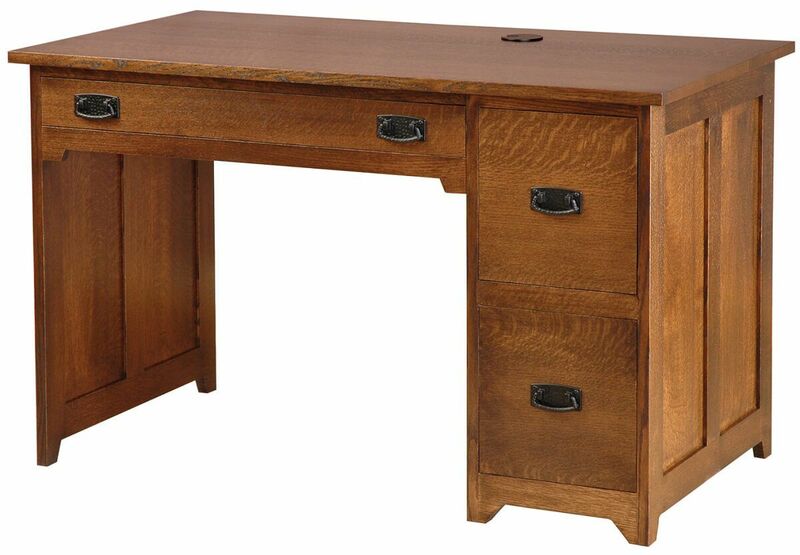 Handcrafted from solid American hardwoods for genuine quality, our beautiful Quaker Desk will complement the Mission decor of any room in your house. Amish woodworkers take pride in providing the finest furniture for your home or office. Our Quaker Desk features durable dovetailed drawers on full extension slides, solid reverse panel sides, and a grommet to conceal the wires of a computer or favorite lamp. With its Mission design you get that classic, yet contemporary look that fits your style and needs. Make your custom wood and stain selections using our online options menu and let Countryside get started on your Quaker Desk today. For the classic look as shown, pair our Burnished Honey wood finish with solid Quartersawn White Oak and black Mission hardware.